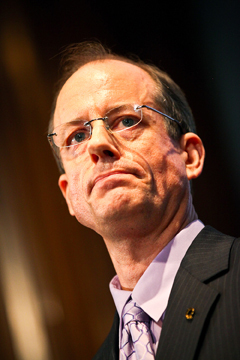 In 2007, former National Security Agency employee Thomas Drake was indicted on charges of supplying top-secret defense documents to Baltimore Sun reporter Siobhan Gorman, who used the information to write a prize-winning series of articles about financial waste, bureaucratic dysfunction and dubious legal practices in N.S.A. counterterrorism programs. According to the indictment, Drake allegedly violated the Espionage Act, a statute enacted in 1917 to charge intelligence agents with giving out confidential information. If convicted, Drake could face up to 35 years in prison. But Drake contends that he is simply being targeted by the government for aiding a reporter in writing a story about fraud, abuse and warrantless domestic spying at the N.S.A. As Drake’s June 13 court appearance in Baltimore draws nearer, we take a look at government repression of free speech and how free speech laws should apply to people who deal with top-secret security information.